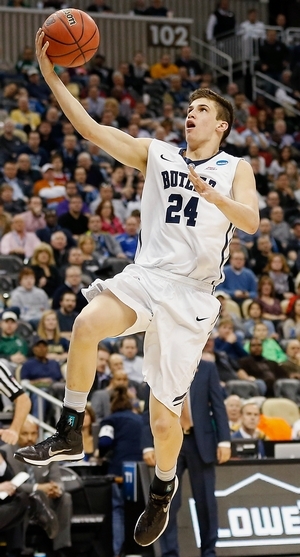 Jacob breaks down Kellen Dunham, a 6-6 senior guard for the Butler Bulldogs. At 6-6, Dunham is the appropriate height for an NBA wing, though he’ll need to continue to add muscle to his slight frame. He’s already added approximately 15 pounds since his freshman year, but has yet to break the 200-pound threshold. He’s not particularly strong or athletic for an NBA prospect, which raises some red flags from the get-go. Dunham will catch teams’ radars for his ability to shoot the ball from deep. He’s a gunner from anywhere on the floor, and is comfortable in catch-and-shoot situations, shooting off screens, and shooting off the dribble. His release is lightning quick, he sets his feet incredibly fast, and he has range extending beyond the NBA line. Dunham converted on 77-of-188 three-point attempts (41%) last season and 84% of his half-court possessions came off jumpers. He’s made more three-pointers and shot the ball at a higher efficiency in every season thus far at Butler, which is a very encouraging sign. But beyond his ability to make shots off the dribble, Dunham’s most impressive quality as a shooter is his adaptability in the air. Seldom will Dunham attempt a straightaway jumper; he seemingly prefers taking leaners, double clutches, or spins into fade-aways. There aren’t many shooters in recent memory who regularly contort their upper body and release away from the defender in mid-air, yet shoot as efficiently as Dunham. Dunham is mostly a shooter right now, as it’s fairly rare to see him create a shot and get all the way to the rim. When he does, he tends to lack the length, strength and explosiveness needed to finish inside the paint in traffic against better competition, finishing under 50% of his “inside the paint” attempts in the half-court. Though he lacks an explosive first step, Dunham’s quick release and propensity to knock down shots off-balance enables him to create inches of space against even the best defenders in the Big East. This is a wrinkle in his game that should separate him from other one-dimensional sharpshooting prospects, even if it remains to be seen how attractive his mid-range game will be in today’s NBA. While Dunham makes his living as a scorer mostly outside the paint, he does find ways to get to the free throw line, which is very beneficial to his teamas an 85% free throw shooter. He is extremely intelligent with the way he initiates contact and forces refs to blow their whistle, having all kinds of crafty tricks in his arsenal to draw fouls. While it’s unlikely that he’ll get to the line very often in the NBA, this is a great example of his basketball IQ and overall toughness, as he’s not afraid to throw his body around. Defensively, Dunham should be commended for his attentiveness and hustle. His feet never stop moving away from the ball and he dedicatedly maintains focus on both his man and the ball. He shows a nuanced understanding of his opponents’ tendencies: in some instances, when his opponent is a weak shooter, he’ll sag off of in a subtle effort to bait the opponent into a shot. In other instances, against a strong shooter, he’ll stay at home on his man although nearby steal opportunities lurk. Entering his senior season, Dunham will need to continue to work on his defense, and maximize his frame and athleticism to enhance his chances of catching an NBA team’s radar. His offensive skillset and height make him an intriguing prospect but his physical limitations are worrisome projecting to better competition.